The following is a list of car seats. Manufacturer names are boldfaced. Weight is in pounds [lb] and height is in inches ["]. See Car Seats: Information for Families for information about choosing the most appropriate car seat for your child. Note: All products listed meet Federal Motor Vehicle Safety Standard 213 as of the date of publication. There may be car seats available that are not listed in this article. The following information is current as of the date of publication. Before buying a car seat, check the manufacturer's instructions for important safety information about proper fitting and use. 23–65 lb, with upper car safety seat back attached. Top of head at least 1" below top of car safety seat back. When top of head reaches top of red line, add upper car safety seat back. Maxi-Cosi Pria 85 Max 5-40 lb, up to 40"
​22–65 lb, up to 49"
​20-65 lb, up to 57". Lower anchors can be used for up to 40 lb. 20-65 lb, up to 57". Lower anchors can be used for up to 40 lb. Disney Grow and Go 5-40 lb, 19"-40"
Yes. 2 forward-facing recline positions available. ​Yes. 2 forward-facing recline positions available. ​22-65 lb, up to 49"
Safety 1st EverFit 5-40 lb, 19"-40"
Forward-facing recline mechanism must be used for children 22-40 lb; optional for use from 40-60 lb. ​High back: 30-100 lb, 38"-57"
High back: 30-100 lb, 38"-57"
​High back: 40-100 lb, 43"-57"
High back: 30-100 lb, 43"-57"
​High back: 30-100 lb, 43"-57"
Backless without armrests: 40-120 lb, 43"-57"
​Harmony Defender 360° 3-in-1 Convertible Deluxe Car Seat	 ​22-65 lb, 27"-57"
High back: 30-110 lb, 34"-57"
Backless: 40-100 lb and at least 4 years of age High back: 38"-57"
Backless: 40-110 lb High back: 38"-57"
Backless: 40-100 lb High back: 38"-57"
Backless: 40-100 lb High back: 43"-52"
Backless: 40-100 lb High back: 43"-57"
nuna AACE High back converts to backless. 30-100 lb Visit www.ezonpro.com for more information. E-Z-ON 86Y Harness/Universal Harness 66-168 lb Visit www.ezonpro.com for more information. E-Z-ON 101/102PB Adjustable Vest (push-button front closure) 20-168 lb and 2 years-adult (XS-XXL and custom sizes) Visit www.ezonpro.com for more information. 20-168 lb and 2 years-adult (XS-XXL and custom sizes) Visit www.ezonpro.com for more information. E-Z-ON 103Z Adjustable Vest (adjustable rear zipper panel closure) 20-168 lb and 2 years-adult (XXS-L, custom sizes) Visit www.ezonpro.com for more information. E-Z-ON 203 Adjustable Vest (mini push-button front closure) 20-65 lb (XS, S, and custom sizes) Visit www.ezonpro.com for more information. E-Z-ON LATCH Vest (LVZ) with adjustable back zippers; has hip straps that attach to the LATCH bars and a top tether anchor strap (can be used in sedan-type family vehicles as a substitute for the MAX Vest) XS, S, M, and custom sizes Visit www.ezonpro.com for more information. E-Z-ON MAX Vest (designed for the "Houdini on a school bus" but may be used in SUVs and vehicles with captain- type seats; NEVER used in typical sedan-type vehicles) 20-168 lb (XXS-L and custom sizes) Visit www.ezonpro.com for more information. Small: 5-12 years (can be used up to 100 lb). Height must be considered—call E-Z-ON for details (custom sizing available). Visit www.ezonpro.com for more information. ​With harness: 22–65 lb, 31"–52". Caregivers should follow NHTSA best practice child car seat recommendations: Children younger than 1 year should always ride in rear-facing car seats, and children 1–3 years of age should ride in rear- facing car seats as long as possible and until they reach the upper height or weight limit according to the manufacturers’ instructions. A child must be a minimum 1 year of age and 22 lb to use this child restraint. Restraint back is flexible and follows the angle/contour of the vehicle seat back. Remove harness and seat back cover and it becomes a backless booster: 40–100 lb, 43"–57", at least 4 years of age, and top of ears below top of vehicle seat. ​Forward facing only. 22–50 lb, at least 30". Stop use when top of ears are level with top of headrest. For more information on the seats listed in this article, please contact the individual manufacturers. Manufacturers of special needs seats have an asterisk (*). 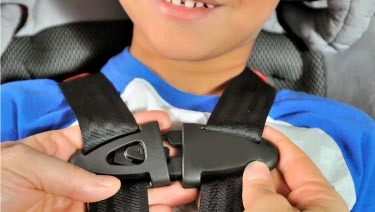 The National Highway Traffic Safety Administration (NHTSA) has put together the car seat Ease of Use Ratings to educate parents and caregivers about car seat features and to assist them in finding the appropriate seat for their needs. You can view this list here.